Travel to Germany, Switzerland, and Italy! Any student or parents interested in traveling to Germany, Switzerland and Italy in 2017 there will be a parent/interest meeting Sunday October 25th at 5 PM in Mr. McCarty's room in the high school. If you have additional questions, or can't attend, please contact Jill Paopao or Joe McCarty. What are these kids doing??? Balancing a cheese ball is a new talent being taught for career development in physical science. Noooooo sirrrreeee Bob! Students are learning about Bernouilli's principle. Ask your physical science student about the other interesting activities that they performed during class!!! You don't have to be crazy to be in English III, but it helps. With a plethora of American authors and Mrs. Lanphear herself, you'd be in good company. By picking apart the classics, we find tidbits we can use in our own writing. We span our learning from the 19th Century to the Information Age; we've branched into and embraced technology. 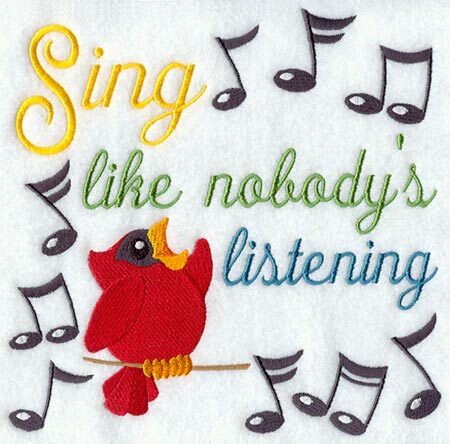 Despite our collective insanity, we've all got something interesting to say: this is our theme for English III. Integrating technology into our lessons is quintessential to the English III class. We use several apps to further our education in American literature including one called Mindly. Abby Orton discovered the app and introduced it to the class for our Alice Walker project. Students utilized the app to organize ideas about Alice Walker's writing using main points and anecdotes to study the piece. The essence of "In Search of Our Mother's Gardens" is creativity, which we connected using our mind(ly) maps. As the English III classes dove into our literature books for the first time, we began with an interesting personal essay titled: "In Search of Our Mother's Gardens," written by author Alice Walker. Walker is a product of an African American, impoverished family and the memories from her childhood, particularly of her mother, inspired this unique work. While searching for a deeper meaning to the essay, classes discovered the main idea of the piece was simply that despite difficult times and rough circumstances, the creative spirit that lives within someone does not have to be dulled and is grown within families. Walker points out, "I went in search of the secret of what has fed that muzzled and often mutilated, but vibrant, creative spirit that the black woman has inherited, and that pops out in wild and unlikely places to this day" (Walker 1295). This essay broadened our knowledge of American literature, as well as provoked thoughts on what "creative spirit" means in our own lives! Creative perspectives range from person to person depending on age, gender, and societal views. Younger children are more openly creative, while adult males find it difficult to define creativity. When asked the question, "What is the most creative thing that you do?" adult males at the high school struggle to answer; however, younger children respond without thought. Children are more likely to think outside the box. Our class concludes that society has taught children to think differently about creativity, regardless of gender. Our class also studied a great African American poet, Langston Hughes, and his American experience. We investigated his poem, "Theme for English B," multiple times using the close reading plan. Through popular vote, we decided upon which skill to expand on, such as: finding the main idea, determining the author's purpose and making inferences. As a group, we discussed the similarities and differences that were caused by race discrimination, the theme of the poem, and the different perspectives on American experience. To test our individual skills, each student was asked to identify who, what, when, where, why and how the author described his experience. After a close reading and discussion of "Theme for English B," it was discovered that many students connected to the text. One of the lines in particular: "I guess being colored doesn't make me not like/ the same thing other folks like who are other races," was especially relatable to our class. In high school, no matter where you are, students are always faced with stereotypes, and classified by their pursuits and appearances. Hughes struggled with this because his skin color set him apart from his Caucasian counterparts, who had the same passions and preferences as he did. This revealed a new perspective--although groups may be stereotyped for their perceived preferences and passions, we are individuals with many surprising common interests. Next, our instructor told us to go home and explore our lineage. Not only did we discover our own cultures, but other classmates' cultures as well. We connected with each other through our heritage and our family's passed down creativities. Our origins brought us together and sparked interesting class discussions, including the difference of women and men's knowledge of heritage. We found that the women knew exceedingly more when it came to historical information, sparking many heated and involved discussions about gender roles in our families. We connected not only to our families, but to each other through intriguing facts, culture, and information about heritage. The second block of English III is chock-full of interesting stories involving the students' ancestors. The stories range from jail breaks in New Mexico to setting up schools in Alaska. In the early 1900s, a student's great-great-uncle bought and sold stolen horses. Although he did not know they were stolen, he went to jail; however, his brothers quickly broke him out. One extraordinary story included a relative getting struck by lightning twice and living to tell the tale. A different student’s ancestor was a self-made millionaire and used his money to build new schools in Alaska. These are just a few of the many exhilarating family stories discovered as a result of our English III assignment. We learned many interesting facts about our fellow classmates' history from the quilt blocks. There were many famous and infamous characters in our classrooms' history. Walt Mays's quilt contained a story about how two of his ancestors traveled on the Mayflower. John Billington, one of these ancestors, was the first person hanged in the New World. April Hardy's story was about how she is related to Blackbeard and the Vikings. Daniel Smith's quilt told a story about his ancestor, John Chapman-- alias Johnny Appleseed. Our classmates have many varying traditions and unique cultures. Shaylee Gunwall's quilt explains how her family makes homemade ravioli and pasta sauce passed down by her family. Aries Ottesen's family has cookies, chocolate cake, and fattigman (a Norwegian cookie or pastry) passed down in her family. All in all, we learned that each of us have stories and physical items passed down from our ancestors that are an important part of our families. So far in this course, our class has discussed the differences between race and gender, and used technology to present and share our ideas. Our theme for English III is to investigate American voices, including our own. Recently, we used social media to inform others about our favorite books and why they should read them too! We shared our recommendations on Twitter using: #CHSreads. This year, English III has already been full of learning, and we're sure that we will continue to discover new American experiences and expand our perspectives. The 2015-16 Chadron High School Health Screenings will be held on Thursday, October 15th for all sophomores and juniors. This is a routine school day so we will be pulling students for a short time to complete a vision screening and hearing screening (provided by the Lion's Club), dental screening (provided by CAPWIN dental) and blood pressure, height, weight, and BMI (body mass index) screenings. 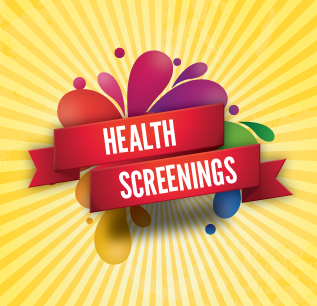 These screenings are not only a requirement by the State of Nebraska but also very important in early diagnosis of potential barriers in a student's ability to learn and grow! Monday - "Flare Out" - wear apparel from your favorite sports team. Tuesday - "Twin Day" - wear matching outfits with your bestie. Wednesday - "Disney Day" - wear your Disney apparel or dress up as your favorite character. Thursday - "Geriatrics vs. Pediatrics" - Upperclassmen dress up as an elderly person and Underclassman dress up as a little child. 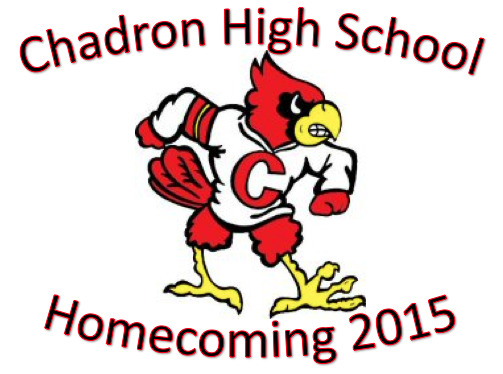 Friday - "Spirit Day" - show your school spirit by sporting your cardinal gear and repping CHS. Homecoming royalty and the coronation of the king and queen at halftime of the football game. Cost: $5 per person at the door - If you bring canned goods, you will receive $1 off at the door. Students Need To Be In School On Time Everyday! The biggest issue Chadron High School faces this year ... is attendance. 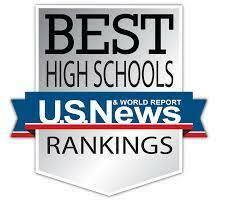 Parents, please help us by having your student in school on time, everyday! One of the most important things your child can do to achieve academic success is also one of the most basic: going to school everyday! In fact, research has shown that your child's attendance record may be the biggest factor influencing his/her academic success. There will be no school on Wednesday, October 7th due to a scheduled teacher inservice. Practices will begin after school at normal times.